Brookfield Multiplex the contractor for Derwent London have published a newsletter ahead of the start of demolition and construction works at 80 Charlotte Street and 65 Whitfield Street. Work is due to start on 24 August 2015 and continue until the end of 2018. It is one of the largest construction projects in Fitzrovia and the largest project by Derwent London in central London and likely to cause major disruption for residents and businesses. 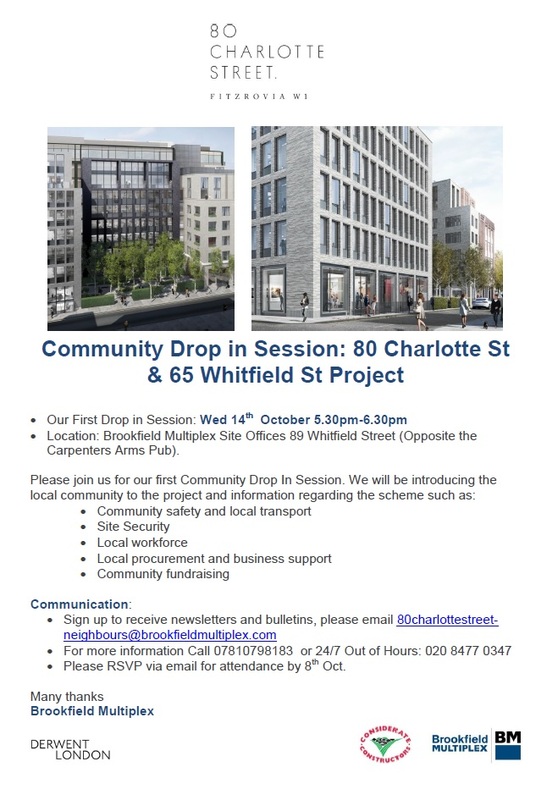 A newsletter distributed by Brookfield gives a summary of works, including site operating hours and other information (but incorrect first drop-in date). Community Newsletter number 1. We’ll have more information in Fitzrovia News in due course. This entry was posted in Environment and tagged Charlotte Street, construction, Fitzrovia, London, Whitfield Street. Bookmark the permalink.